Gionee just unveiled the first two offers in its brand new "A" line of devices. The Gionee A1 and A1 Plus both come with big batteries and a focus of selfies and audio quality. These seem to be the pillars of what Gionee believes will be a winning market combination for 2017. Starting with the smaller A1, it measures 154.5 x 76.5 x 8.5 mm and weighs in at 182 grams. This is a bit on the chunky side, but a fairly large 4,010 mAh does probably account for a lot of that. It is powering a 5.5-inch, FullHD AMOLED panel, a MediaTek Helio P10 chipset, 4GB of RAM and 64GB of expandable storage. At least on paper, this does spell out impressive battery endurance. 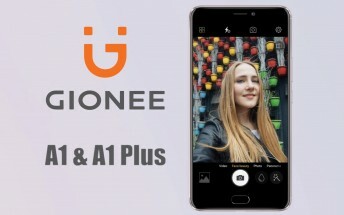 To top things off, the Gionee A1 also has Dual-SIM sipport, a 13MP, f/2.0 main shooter and a 16MP, f/2.0 one on the front, complete with a selfie flash. It is offered in Gray, Black or Gold and boots Android 7.0 Nougat. Its bigger brother, the A1 Plus, ups the stakes in most departments. It measures 166.4 x 83.3 x 9.1mm and tips the scale at 226 grams. The display is up-sized to 6-inches at a FullHD resolution, however, this time around, it is a simple IPS LCD panel. The battery is even bigger in this one at 4,550 mAh and the processor is swapped for a MediaTek Helio P25. RAM and storage are kept at 4GB and 64GB, respectively. The camera setup on the A1 Plus is drastically different as well. Is is rocking a dual setup on the back - 13MP plus 5MP, f/2.0. Selfies are handled by a 20MP, f/2.0 shooter. Color options and the Android OS are identical to the non-Plus model. The A1 Plus has a few other tricks up its sleeve as well, like 18W Ultrafast Charge technology that adopts a two chip solution for faster top-offs. There is also a stereo speaker setup, with audio quality improvements courtesy of MaxxAudio. Additionally, hidden away next to the main camera flash is a tiny IR emitter - an increasingly rare feature. Pricing is set at EUR 349 for the A1 and EUR 499 for the A1 Plus. The former should hit shelves in March this year in India and Nepal first, while its bigger sibling is expected in April.